The dust may have begun to settle following the deadly earthquake which claimed over 500 lives in Ecuador on Saturday, but the extent of that tragedy is far from fully measured for those who survived. This week, while scouring the rubble for signs of life amid the devastation, photographer Hugo Cedeño happened upon a truly heartbreaking scene. 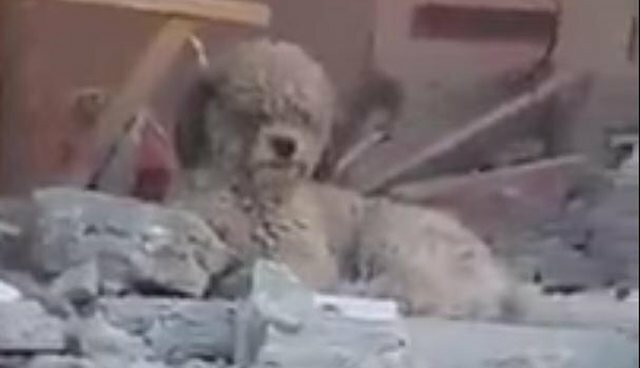 There, all alone amid the rubble of a home destroyed by the quake, sat a dirtied white dog gazing out upon the sea of wreckage. He was waiting for his owner to return. The dog's faithful vigil, however, was held in vain. Sadly, his owner was among those who perished. Footage of the dog posted online quickly went viral, with some dubbing him the Ecuadorian Hachiko - in reference to another famously loyal pet who too refused to give up hope after his owner died. Fortunately, Cedeño wasn't about to give up hope either. Working with a local animal rescue group, the photographer coordinated to have the dog brought to safety. Max, as he's known, has since been treated by a veterinarian and adopted by his deceased owner's relatives. It may be a long road ahead for the hard-hit region to recover and rebuilt after the quake, but there's no small assurance in knowing the mending of broken hearts is already underway.